The central problem of theoretical linguistics is the question of learnability: how is it possible for the adult to have constructed her grammar from the available input? The central problem of the study of language acquisition is essentially the same, but with an added dimension, namely, how is it possible for the child to construct her grammar from the available input over time? Thus the study of the course of language development places even heavier constraints on the linguistic learnability problem. Not only do we have to understand what’s in the child’s mind so that grammar can be ultimately selected, but we have to make sure that learnability problems that arise in the course of development can be adequately resolved. 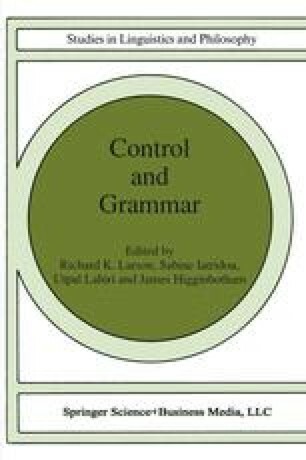 This paper is an attempt to explore some of the acquisition and learnability problems that arise when we study the development of control. I would like to thank Helen Cairns, Noam Chomsky, Helen Goodluck, Dana McDaniel and Steve Pinker for commentary on an earlier draft. Thanks also for discussion to Yu-Chin Chien, Robin Clark, Jim Higginbotham, Jim Huang, Kyle Johnson and Richard Larson. Insightful suggestions were also made by an anonymous reviewer. The author was supported by NSF Grants BNS-8820585 and INT-921177.